We’ll be honest, this is a win-win situation for dog owners and non-dog owners. On the one-hand, if you have separation anxiety from your pup and refuse to holiday without them, this article is for you. On the other hand, if you just love dogs in general and kind of want to see a bunch of them hanging around at your hotel because any dog-sighting is a good dog-sighting, this article is also for you legends (we’re not even judging). 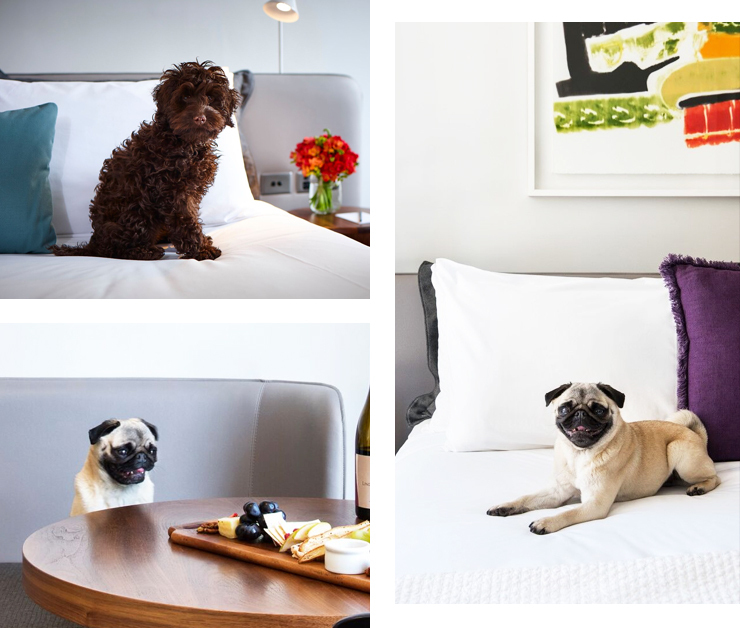 Here are the best dog-friendly hotels in Sydney. No surprise (unless you’ve been living under a rock), Pier One is welcoming your four-legged companions with open arms. And the best thing here is that these legends have super special waterside accommodation for anyone who wants to bring along their pup, including beds, water and food bowls. Plus if your pooch is all about that luxe life (who isn’t? ), there’s also a mini bar loaded with dog-friendly snacks. So apart from the fact this beauty is killing it when it comes to housing one of the prettiest indoor pools around (cue a blue pool surrounded by star lights for days), The Langham is the one place in Sydney that is well and truly fit for the gods AKA fit for the dogs. Your furry companion will receive 5-star service just like yourself (with pet-sitting and dog-walking also available). Dog hotel or human hotel? To be honest, who knows. This boutique sensation is scoring 10/10 on both fronts anyway. Because we’re all for class and convenience with pet-sitting, dog-walking and the option for your pup to take a trip to the Doggy Day Spa when they’re feeling a bit fluffy. Medusa Hotel is throwing up the ‘easy-as’ dog hotel stays (all you need to do is give them the heads up at least two days before that your pup will be tagging along with you). There are also a number of rooms on the bottom level for your furry pals and a central courtyard if your drooling S/O feels like basking in the sun. While you’re scoring free access to fitness studios, morning yoga and ordering epic feeds on the in-room iPad you can rest assured that your doggo will be well catered for (especially if he or she loves a good view of Sydney). There are four Courtyard Rooms for anyone bringing along a pooch with treats, food, water and a bed all on hand (or paw) for them. This little harbour gem is home to green lawns (think all the space for your little ball of excitement to play in) and located on the Sydney Harbour foreshore. And to top it off, you’re in an ideal area to take Buster for a glorious urban walk featuring all the trees and leaves he could want. No doubt if you’re parenting a pup, you’ll be well-acquainted with the #lodgelife (because anything with more space and more trees is a dream). Along with the cottage feels of absolute peace, pets are allowed to join your stay at an extra charge which is worth it for the sake of Buster’s separation anxiety (and let’s be honest, yours too). Man, oh man. Are the Goodlife Suites the definition of luxe or what? Answer: they most definitely are. 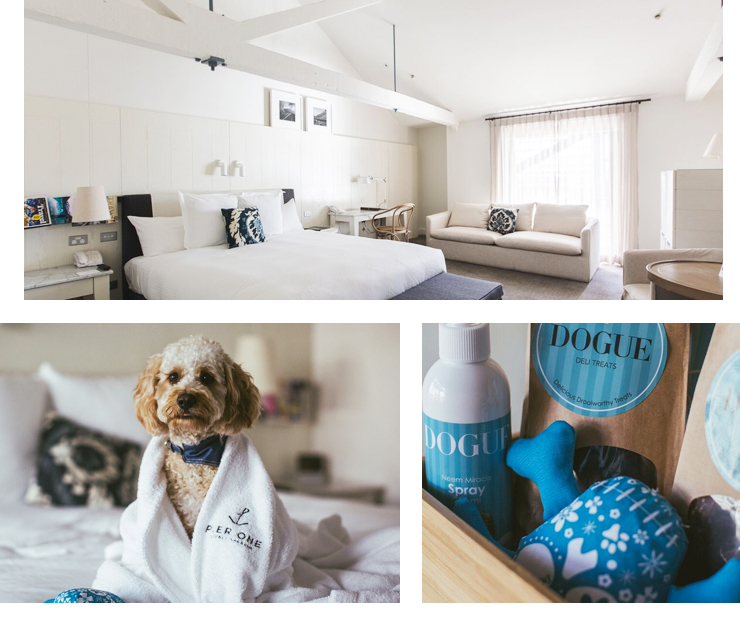 Cue a modern design, courtyard, shared lounges (to mingle with other pet-owners, obvs) and the mere fact your pet pooch can pack their bags and treats and join you.